StarDust Slot Machine | Enjoy a No Download Free Play Demo Here! Powered by Microgaming software and featuring classic themed gaming symbols that can appear stacked on the reels, StarDust slot machine offers a top base game win of $250k. Respins and free spins with super stacked icons and 1024 paylines in play add plenty of payout punch to this 5 reel and 40 line game. Despite the Microgaming Go mobile suite, the game is not supported on digital devices. Read the review and enjoy StarDust free play slot available as a demo right here, where no download and no registration is needed. Then it's simply a matter of upgrading to GoWild Casino, a recommended gambling destination for Canadians with an exclusive free spins bonus to whet the appetite! Players in Canada can choose from a $0.40 to $100 a spin betting range to get the reels rolling of StarDust slot machine. As winnings are multiplied by the value of your stake, it pays to bet big. You can scoop up a top payout of 2,500x the line bet in the base game. Had you wagered $100 as spin, you'd bank a tantalising $250,000 in Canadian dollars, a significant prize when compared to the meagre $1k payout generated by the lowest available bet. Continue reading the review to find out how you can pocket plenty more in the bonus rounds, or charge up the free play demo for a preview of the action! In addition to standard play, Microgaming has included special features that can boost the betting account. The StarDust symbol is wild, appears stacked during the base game and super stacked in the free spins round. Land three or more gem scatters anywhere and you'll earn 13 free spins, the wild appears super stacked on reels 4 and 5 and 1024 paylines are active. Furthermore, after every three-symbol win, the Radiant Respins feature kicks in, unlocking one respin of reels 4 and/or 5 to realise extra line wins. 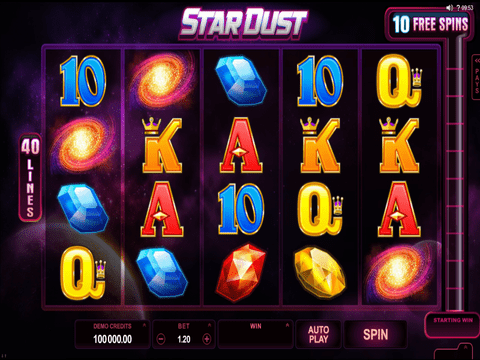 StarDust slot machine has the look, feel and classic slots symbols of NetEnt's Starburst slot. Although the games share a respins feature and a maximum $100 wager, only 10 paylines are active in Starburst online slot. This effectively means the available base game wins are slashed by a quarter of the value when compared to the 40 line MGS betting opportunity! If that doesn't convince you to play StarDust slot instead, perhaps a quarter of a million payday will do the trick. After all, there's only $50,000 tops available in the NetEnt slot when you sign up at GoWild Casino!